Alarm about the nation’s health is a rational response to recent evidence. Current health problems should be treated with as much urgency as a winter bed crisis in the NHS. The recent evidence has three components, probably linked. Improvement in life expectancy, going on for 100 years, has slowed since 2010. Second, health inequalities, which probably became smaller during the 2000s, have grown again since about 2012. Third, there is a persistent North-South divide in health—particularly marked among younger people. On the first, between 1920 and 2010, life expectancy increased from 55 to 78 in men, and from 59 to 82 in women. We simply got so much healthier as a society, remarkably quickly. Over the long haul, life expectancy increased by about one year every four years. To see how remarkable that is, think that if you rose at 6 in the morning, by noon you still have as long to live as you did when you woke—6 hours every 24 hours. There was, though, a marked slowing of the rise after 2010. From 2011-2016 the increase was about 1 year in 6.5 in men and 1 year in 10 for women. The big question is: why the slow down? Perhaps we are getting close to peak life expectancy; the argument being that it has to level off sometime. The figure (below) would suggest that is not the case. 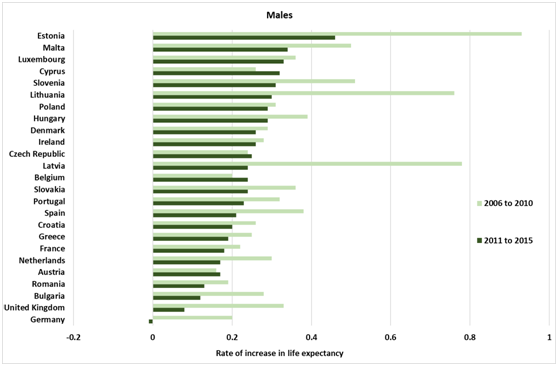 It shows the increase of life expectancy each year in 25 EU member states. Between 2006 and 2010, the improvement in the UK was about the middle of the European range. While there was a slowing of the increase in most of the countries listed, it was particularly marked in the UK: from 2011 to 2015 the increase in life expectancy was slowest among women and second slowest among men. Were this to keep up, we would become the sick man and woman of Europe. The fact that the rise of life expectancy slows if not flattens in the UK after 2010, means we have to ask what happened in 2010 and beyond. Austerity is an obvious candidate. Spending on the adult component of social care was reduced by more than 6% since 20019/10, at a time when the population 65 and over grew by one sixth. Health service spending grew at an annual rate of 3.8% from 1978/9; this slowed to 1.1% after 2010. Both these cuts will have an impact on quality of life for older people—how could they not?—the question is whether they are having impact on length of life. It is urgent to ask that question and European comparisons may help. The thrust of my reports and my book, The Health Gap,  is that health and health inequality are important measures of the degree to which society is meeting fundamental human needs. Health is not simply related to health care, important as that is when people get sick, particularly for the elderly with multiple needs. It is tempting to attribute these health problems to particular government policies. Tempting, but wrong. For example, the great credit crunch bit deep in Britain. Real wage growth 2007-15 was slower in the UK than in all other European countries, bar Greece. That causes real social and economic problems, but could it effect mortality at older ages where the majority of deaths occur? I don’t have an answer to these questions but I am writing to Jeremy Hunt urging him to address these problems in the nation’s health. It is urgent. Hiam L, Dorling, D., Harrison, D., McKee, M.,. What caused the spike in mortality in England and Wales in January 2015? Journal of the Royal Society of Medicine. 2017;110(4):131-7. Marmot M. The Health Gap. London: Bloomsbury; 2015. Barr B, Higgerson, J., Whitehead, M. Investigating the impact of the English health inequality strategy: time trend analysis. BMJ. 2017;358:j3310. 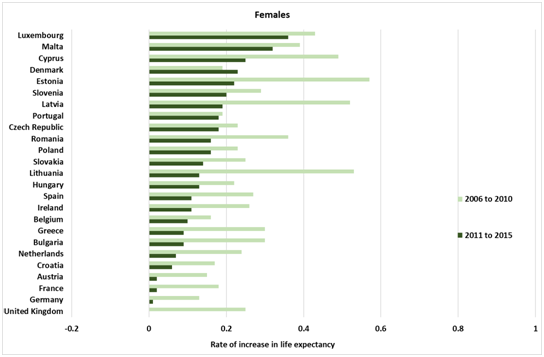 Buchan IE, Kontopantelis, E., Sperrin, T., Chandola, T., Doran, T. North-South disparities in English mortality 1965–2015: longitudinal population study. J Epid Comm Health. 2017;doi:10.1136/jech-2017-209195:1-9. 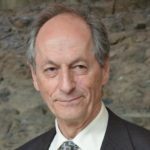 Whitehead M. Due North: The report of the Inquiry on Health Equity for the North. Liverpool UK: University of Liverpool and Centre for Local Economic Strategies; 2014.